I’m guessing many of you will have to doubletake the supplied image. Its a……., no its not, its a……..part Mustang, part Dodge Daytona, this is the ‘Daytona Hemi Stang’ which should have Ford and Mopar people reacting like they’ve just been plugged into the mains supply. Dan Dhondt has owned the car for 38 years making it into the creation you see here. 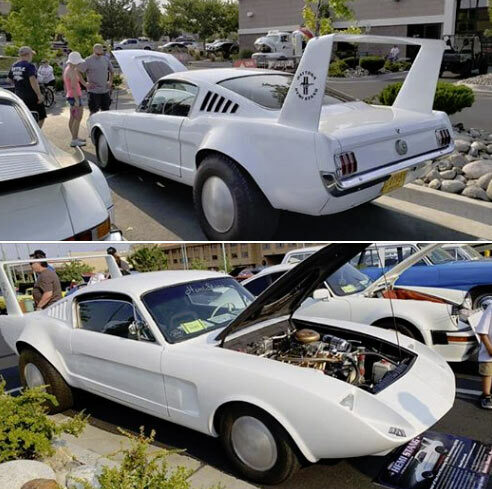 An original 1966 1/2 Mustang fastback with a 1 of 50 Fiberfab front-end (Fiberfab made kit car parts), 1956 354-inch Hemi V8, Chrysler two-speed push button PowerFlite transmission and factory 8 inch Ford rear end, original leaf springs in the rear, parallel leaf springs up front and factory drum brakes. When I found the car posted on Facebook, as you can imagine it triggered a slew of polarised comments from purists all round (link below). Firstly, the initial comments will give you an idea of what people thought of the original Dodge Daytona and the Plymouth Superbird when it first came out, back in the day. The looks were too extreme and it didn’t sell very well. It’s only in hindsight people appreciate what it was. however, mixing brands together in a hobby where owners support their brands and models harder than their favourite sports team is a very brave move. Take a step back, forget about makes and models and just look at the design alone. It actually makes the overall design more sleek and elegant. No matter your opinion on this vehicle, it’s a very brave build. Find out more about the car from the links below. I think this gets classified under the WTF file?